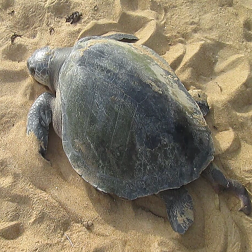 The Olive Ridleys are the smallest of the sea turtle species found in Liberia. They can grow to be 62-70 cm (2 to 2.5 feet). The shell (carapace) of the ridley is olive colored and fairly heart-shaped and undersurface is a greenish white. Their head is quite small and carapace is bony without ridges and has no large scutes (scales) present. The Olive ridley carapace has 5 or more lateral scutes and is nearly circular and smooth. Its hatchlings are black when wet with greenish sides. The Olive ridley feeds on shrimps, crabs, mollusks, fish and tunicates. They come to the beach to lay eggs 2 times each season and their eggs are as much as 110 which take 52 to 58 days to develop. Olive ridleys live in tropical and subtropical waters of the Pacific, Indian and Atlantic Ocean.